If you would like to help Myles Power’s fight against pseudoscience you support him by buying one of his boxes of SCIENCE! Each box contains a experiment that are not found in your normal toy store and can be performed safely at home. This forensic kit contains Luminol which can be used to produce a chemiluminescent (light producing with very little heat) reaction. This reaction will emit a blue glow for about 30 seconds that can be seen in a darkened room. It uses copper as a catalyst, but can also use iron which is found in blood. The reaction only needs very tiny amounts of blood (1 part per million) to work. This is why it is used by forensic investigators to detect trace amounts of blood left at a crime scenes. This kit contains a copper catalyst as well as a safety lancet so you can perform the reaction using your own blood if you so wish. The kit also contains a spray bottle and instructions on how to use it to detect blood as a forensic investigator would. It is generally difficult to make a magnetic liquid because once you melt a magnetic material (for example iron) it will no longer be magnetic. This is because the melting point for iron is 1000˚C, but its Curie point (the temperature when magnetic materials lose their magnetism) is 800˚C. A ferrofluid, however, is liquid at room temperature and becomes strongly magnetized in the presence of a magnetic field. This means that you can use ferrofluid to visualize the magnetic field it is placed into. 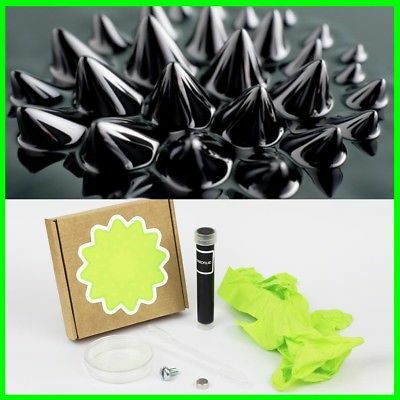 The Ferrofluid experiment kit contains everything necessary to conduct fascinating experiments with Ferrofluid in a safe and controlled manner. This kit will amaze you and your students, children, friends, etc. DNA (short for Deoxyribonucleic acid) is a molecule that carries the genetic instructions used in the growth, development, functioning and reproduction of all known living organisms and many viruses. Most DNA molecules consist of two strands coiled around each other to form a double helix. DNA in animals, plants, and fungi is located within a nuclear membranes called the nucleus of a cell. This itself is protected from the outside environment by a cell membrane, which consists of two layers of phospholipids. Therefore, in order to extract DNA from the strawberries cells, the phospholipid cell walls and nuclear membranes must first be broken (cell lysis). 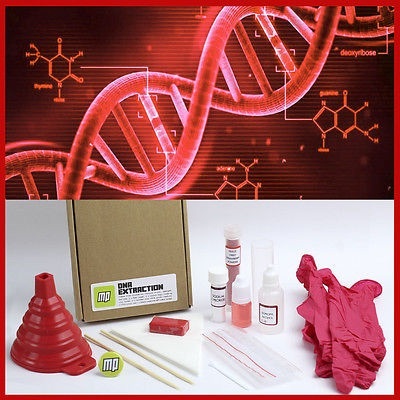 This kit contains everything you need to extract DNA from a strawberry (free dried strawberries included in this kit) in a safe and controlled manner. The DNA can then be physically seen and manipulated with. 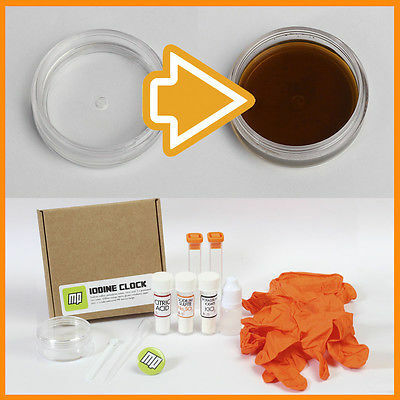 The iodine clock reaction is one of the classic chemical reactions you are shown in school/university. Two colourless solutions are mixed together and, in a given amount of time, the solution suddenly turns dark blue – almost black. There are several variations of the clock reaction but this contains the iodate version.